Not surprisingly the Borden plot is the most visited site in Oak Grove Cemetery. On the day of the funeral of Abby and Andrew Borden, only grass and many trees surrounded the open graves lined with pine branches. 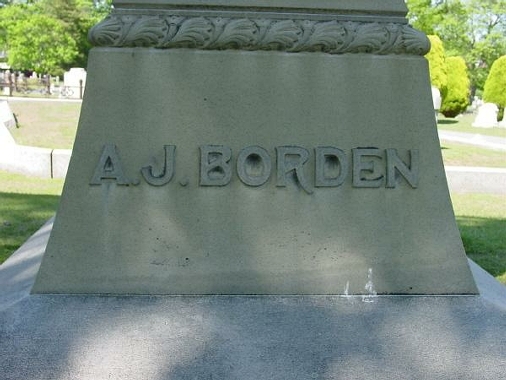 Of course the Bordens were not buried on the date of their joint funeral, August 6, 1892, but instead lingered in a holding tomb at the cemetery awaiting a full autopsy on August 11th and burial at last on August 17th. 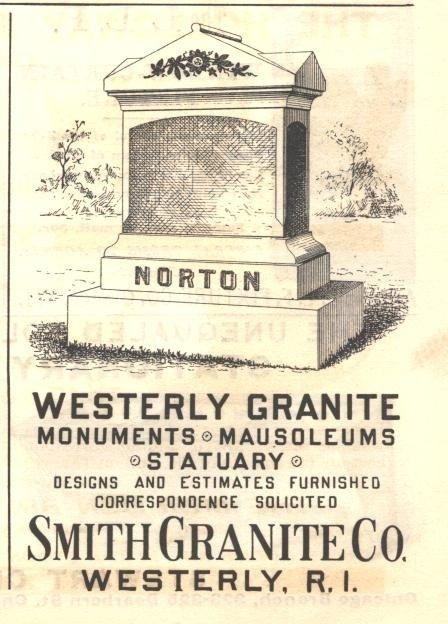 It would not be until January 1895 that the stately Westerly blue granite monument would be set in place, along with the rectangular headstones bearing the initials of the victims. With Fall River being famous for granite, especially rose granite, one wonders why Emma and Lizzie Borden did not shop for a fitting monument in their own home town. 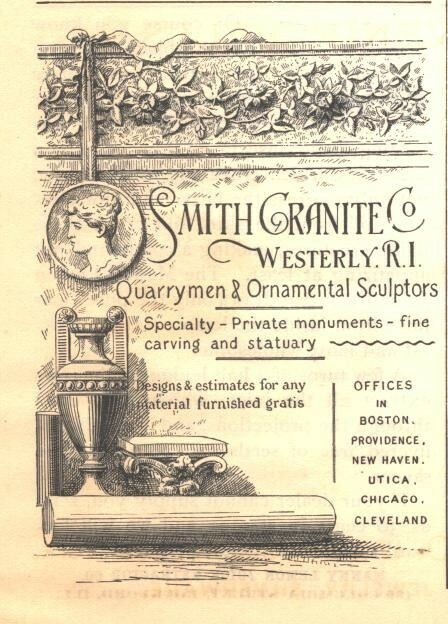 The fact was that Smith’s Granite Company of Westerly, Rhode Island was the most prestigious monument supplier of its day, with offices in many major American cities. Providence would have been the nearest branch to Fall River. 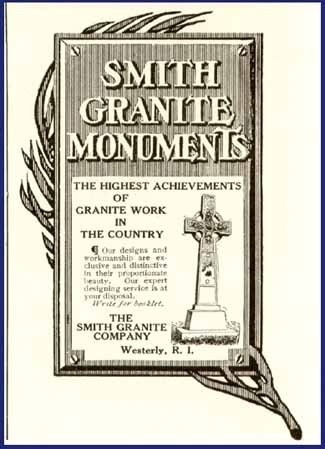 Smith’s could claim orders from all of the finest old families as well as being in demand to supply important statues and civic monuments and memorial stones across the country. Emma and Lizzie chose the very best to mark the site of their eternal rest. 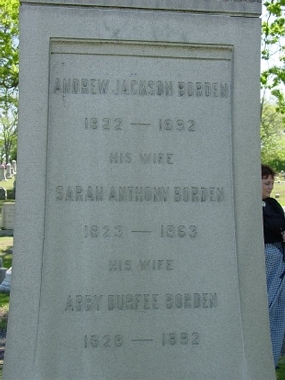 The stone was ordered on July 2, 1894, almost two years from the date of the burial of Abby and Andrew Borden. The stone is nine feet in height and is divided into five separate segments. 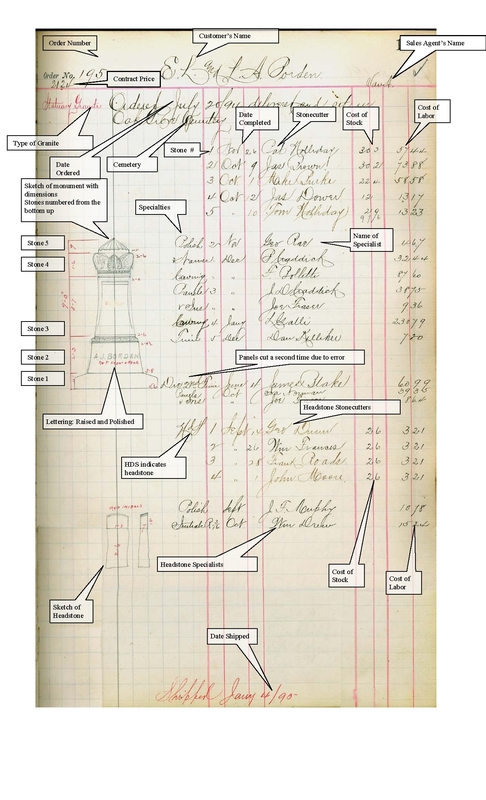 The cost of the labor and materials is carefully noted in the order book, and the date of each stage of the work is listed when completed at the top of the page by stone numbers 1-5. 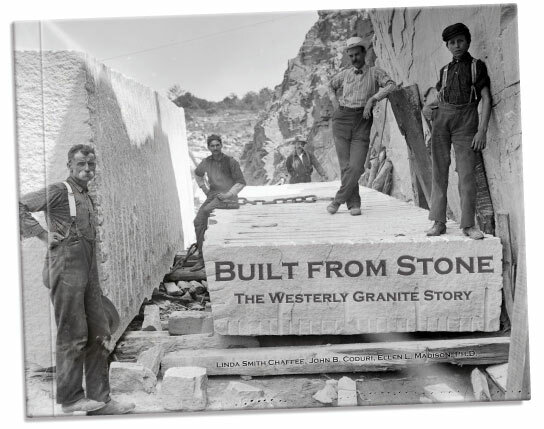 The stone was crated and shipped by rail on January 4, 1895. The base is Stone #1, #2 is the section containing A.J. Borden in raised and polished letters, #3 is the panel stone where names and dates are inscribed, #4 is the most intricately carved by master carver, Mr. L. Galli who was paid $230.79 and #5 is the cap stone. 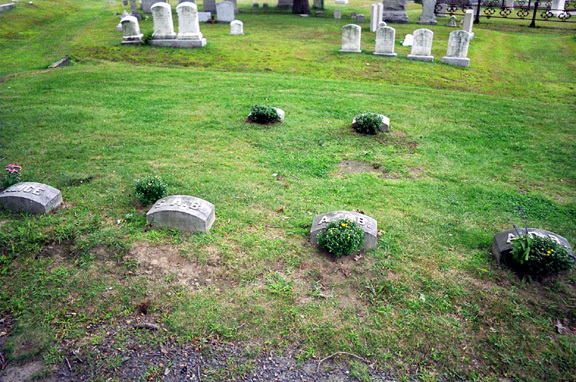 At the bottom of the page appears the order for the small headstones. There are four of them with the lettering and polishing done by William Drew and J.F. Murphy. 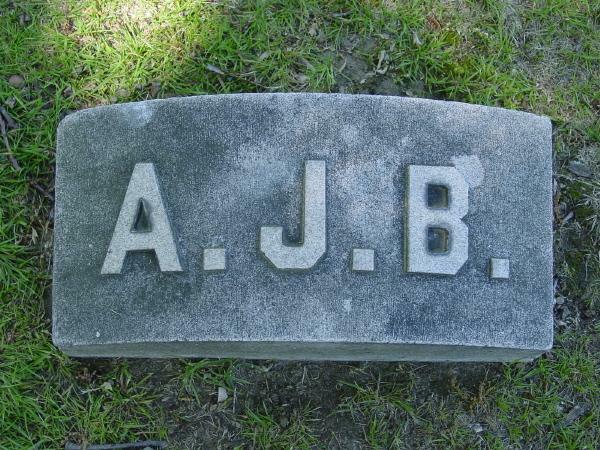 The four are AJB,(Andrew Jackson Borden) ADB, (Abby Durfee Borden) SAB (Sarah Anthony Borden) and the full name Alice, the sister who died very young. No doubt the matching headstones of Lizzie and Emma were added at a much later date, and also the inscription on the panel of the main marker added in 1927 or later. It is interesting to note on this order sheet that the panel engraving had to be done twice due to an error. 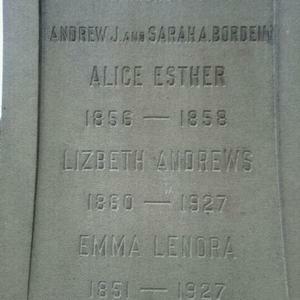 Many have remarked that there is an “S” added to Lizzie’s name and wondered if this was an order left by Lizzie to be completed after her death or merely an error on the part of the carver, who may have thought Andrews was a surname and that Andrew was an unlikely middle name for a woman. 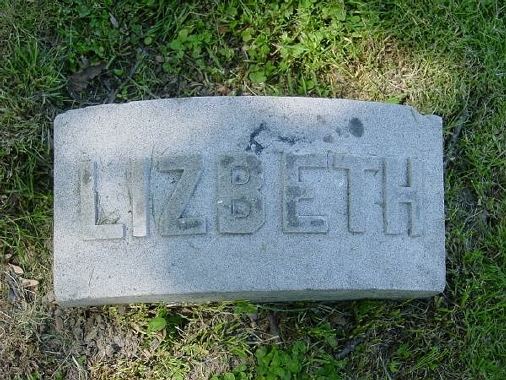 Lizzie had, herself, opted to change her name unofficially to Lizbeth, but is not known to have added an “S” to her middle name of Andrew. It is unknown exactly when the names of Emma and Lizzie, and their dates of birth and death were added to the panel, or whether either sister ever actually saw the panel with their names on it. It is not uncommon to have names and dates of birth engraved on a stone while the person is still alive, with the death date added after the fact. This may or may not have been done at the time of the creation of this monument. As particular as Lizzie was known to be, it would be easy to make the case that she never saw the panel in life to catch the error. Newspapers printed that on the day of the stone’s installation, Lizzie and Emma went out to inspect the work. It was reported that Lizzie only gave a cursory glance and then went back to her carriage. Emma is said to have made a careful inspection. The cost today of the stock and labor for this monument would be many times the figure on this work order. Pat Holliday, Jas. Brown, Mike Burke, Jas. Dower, Tom Holliday, George Rae, P. Craddick, F. Polletti, J.D. Craddick, Joe Frasier, L. Galli, Dan Kelleher, James Blake, Ira Norman, George Dunn, William Frances, Frank Roads, John Moore, J.F. Murphy and William Drew. 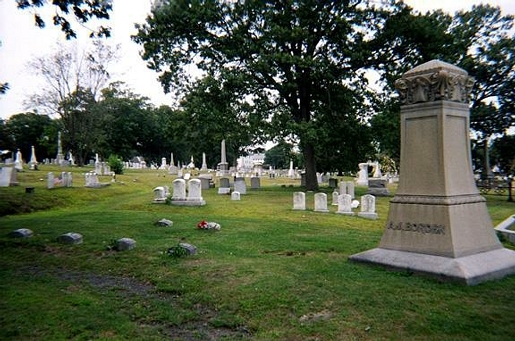 Alexander Lawson, a Scottish-born stone carver from Aberdeen, who immigrated in the great Scottish wave which came to America lived and worked in Westerly, Rhode Island before moving to Fall River to open his own granite works and monument business on Prospect Street, just outside the gates of Oak Grove Cemetery. The family lived on Robeson Street for many years, and the business was inherited by Frederick Lawson, Alexander’s son and prospered for many years. Alexander Lawson is credited with the carving of the 1873 arch at Oak Grove.